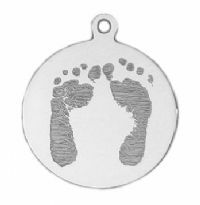 Our 14K white gold round charm is custom engraved with your loved one's actual handprint and footprint images for a truly one of a kind personalized keepsake. On the back, you can engrave up to 3 lines.The first line of personalization is included in the price. Fill out engraving fields below. An additional set of prints can be engraved on the back for an additional charge, select the option below. This is an ideal way to incorporate handprints on one side and footprints on the other side. Also great as a memento of twins. If additional prints are chosen for the reverse side, only 1 line of engraved personalization can fit on each side. Looks beautiful as a necklace, select chain options below.